Your branch is behind 'origin/master' by 565 commits, and can be fast-forwarded. Because flutter_tools depends on sockjs_client 0.3.5 which doesn't match any versions, version solving failed. Command 'pub upgrade' still failed after 10 tries, giving up. 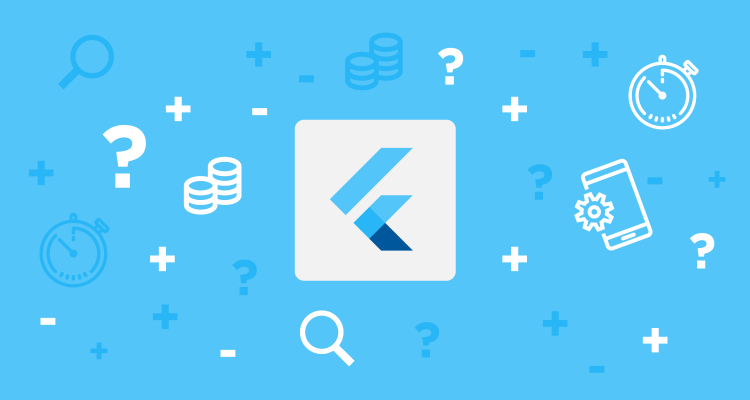 I am new in Flutter technology, Please elaborate, how to start development in the flutter? I have followed "GET STARTED DOC" for Flutter but not getting the idea of how to create a new app for IOs and Android using flutter? How to run an application in a real Android Device? I have import Image in My Flutter Project How to set Background Image on the Mobile Screen in the Flutter Framework. I am developing an app in which I want to integrate PayUMoney payment gateway. I am not able to get pure PayU Money Integration Details. I have an account of PayU Money but there is no Merchant key-salt. We request you to kindly share Play store application link of your app from the registered email id of the account in order to get your App integrated with PayUmoney. Please note that your website (or app) should be live ( Homepage, Products/Service with proper image, Product/Services Description and rates (in INR), Add to cart and Checkout Page etc.). Be informed that you need to sign an agreement in order to complete the process. Feel free to get back to us for any other clarification. I don't have any idea how to Integrate PayUmoney in Android Application? I have use a tutorial with there Testing Details that was working fine when we change testing details to our it giveing issue Like not showing any Guest Account Login for none PayuMoney Users. How to resolve all these issues Please have a look. I want to show Rs and Doller in my app according to the Country but I don't want to get permission to get User's Current Country. I will change Rs. sign to Doller if User's Country is not India that will get by User's Mobile Location. this code gets User's Default set Location in Setting. But I want real Location Only Country. How to get Mobiles Current Country Name Or Country Code without any Permission and User's Interaction with android? Why I am getting "\ from my String Object ? Instant Run requires 'Tools | Android | Enable ADB integration' to be enabled. this error in a popup. I am not getting this issue why it is happening before this everything working fine but when I use Onboarding Lib it start me giving this error. IntentService is a base class for Services that handle asynchronous requests (expressed as Intents) on demand. But I have a confusion when I have to use Services or IntentService? I was using AsyncTask for getting and posting data in Webservices. that was working fine for my purpose but i need to use Retrofit now. I have heard more about retrofit performance. How can i implement retrofit in my Android project and get and post data on Webservices? How can I test my Payment integration with CCAvenue test Account details? I have searched for the details but CCAvenue removes there pdf link so that link is unavailable. How to find details of testing Payment gateway? 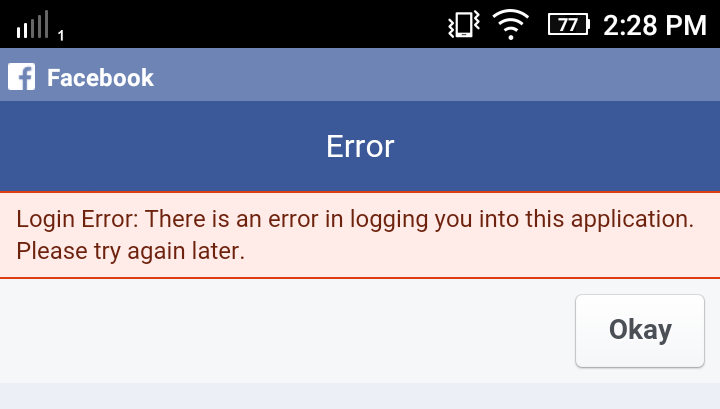 When I trying to log in with facebook in my Android app it gives me this error: Login Error: There is an error in logging you into this application. Please try again later. I have searched google many people facing this issue but No one knows the reason why its occurs. Please help How can resolve this issue? 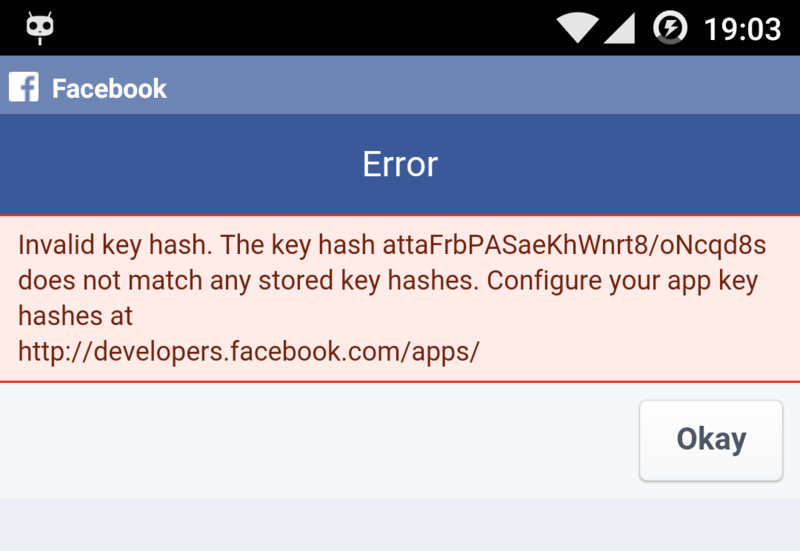 I have configured all things fine for the first time my app was worked perfectly but today it's giving me this error. I have tested facebook configuration that is fine. Search whole day but not got any solution they are saying remove configured settings and delete the app from Developer account and then again create a fresh configuration. I have done it also in one-day same issue occur. I have a Linearlayout which has a scrollView with a number of elements within it. At the bottom of the scrollView I have a listView which is then populated by an adapter. It is showing me only first element of ListView. The problem that I am experiencing, is that Android is excluding the listView from the scrollView as the scrollView already has a scrollable function. I want the listView to be as long as the content is and for the master scroll view to be scrollable. How can I achieve this behavior? Android Studio was first announced at a Google I/O conference in 2013 and was released to the general public in 2014 after various beta versions. Prior to its release, Android development was handled predominantly through Eclipse IDE, which is a more generic Java IDE that also supports numerous other programming languages. Android Studio’s job is to provide the interface for you to create your apps and to handle much of the complicated file-management behind the scenes. What is Now for Update Android Studio? Android Studio 3.0 has been released to stable. Download it here. If you've set your Android Studio update channel to canary, the SDK Manager should now show an update to receive version 26.2.0 of the Android Emulator. QnA is Updated with the Android Systems New things. This is the first release to include the new Quick Boot feature, which makes the Android Emulator start up much faster based on a snapshot of your previous AVD instance. Quick Boot is enabled by default for all AVDs. Although the first time you start an AVD it must perform a cold boot (just like powering on a device), all subsequent starts are fast and the system is restored to the state at which you closed the emulator (similar to waking a device). Learn more about Quick Boot here. Android Studio 3.0 RC 2 is now available in the Canary, Dev, and Beta channels. This update includes general bug fixes, including a fix to properly update from previously installed versions of the IDE on Linux and Windows. is now officially supported in Android Studio, including features likes code completion and syntax highlighting. Java 8 Language features — To update your project to support the new Java 8 Language toolchain, simply update your Source and Target compatibility levels to 1.8 in the Project Structure dialog. Layout Editor — The component tree in the Layout Editor has with better drag-and-drop view insertions, and a new error panel. Adaptive Icon Wizard — The new wizard creates a set of launcher icon assets and provides previews of how your adaptive icon will look with different launcher screen icon masks. Support for VectorDrawable layers is new for this release. XML Fonts & Downloadable Fonts — If you target Android Oreo (API Level 26 and higher) for your Android app, you can now add custom fonts & downloadable fonts using XML. Android Things Support — A new set of templates in the New Project wizard and the New Module wizard to develop for the Android Things platform. parameter hints, semantic highlighting, draggable breakpoints, enhanced version control search, and more. Instant App Support — You can add Instant Apps features to your project. Build Speed Improvements — A rare breaking API change in the Android Gradle Plugin to improve scalability and build times is one of reasons the version number has jumped from 2.4 to 3.0. If you depend on APIs provided by the previous Gradle plugin you should validate compatibility with the new plugin and migrate to the new APIs. To test, update the plugin version in your build.gradle file. Google’s Maven Repository — To facilitate smaller and faster updates, Android Studio 3.0 utilizes Google’s Maven Repository by default instead of using the Android SDK Manager to find updates to Android Support Library, Google Play Services, and Firebase Maven dependencies. Used in combination with the latest command line SDK Manager tool and Gradle, Continuous Integration builds should migrate to Google’s Maven Repository for future Maven repository updates. Play Store, allowing developers to do end-to-end testing of apps with Google Play and keeps Google Play services up-to-date in Android Virtual Device (AVD). The emulator system images are signed with a release key so you will not be able to get elevated privileges. You can use the Android Open Source Project (AOSP) emulator system images for that. OpenGL ES 3.0 Support in Android Emulator — OpenGL ES 3.0 support for Android Oreo system images along with significant improvements in OpenGL ES 2.0 graphics performance for older emulator system images. App Bug Reporter in Android Emulator — An easier way to generate a bug report with the Android Emulator with all the necessary configuration settings and space to capture your repro steps. Proxy Support in Android — A user interface to manage the HTTP proxy settings used by the emulator. APK Debugging — Debug an arbitrary APK. As long as you have a debuggable version of your APK, you can use the new APK Debugging features to analyze, profile, and debug the APK. If you have access to the sources of your APK, you can link the source to the APK debugging flow for a higher fidelity debugging process. in both the View Tree and Properties Panels. Device File Explorer — The new Device File Explorer in Android Studio 3.0 allows you to view the file and directory structure of your Android device or emulator. As you are testing your app, you can now quickly preview and modify app data files. Android Test Orchestrator Support — When used with AndroidJUnitRunner 1.0 or higher, the Android Gradle plugin 3.0 supports the use of the Android Test Orchestrator. The Android Test Orchestrator allows each of your app’s tests to run within its own Instrumentation. app. Once you deploy your app to a running device or emulator, click on the Android Profiler tab and you will now have access to a real-time & unified view of the CPU, Memory, & Network activity for your app. Each of the performance events are mapped to the UI event timeline which highlights touch events, key presses, and activity changes so that you have more context on when and why a certain event happened. APK Analyzer Improvements — Additional enhancements to help you further optimize the size of your APK. This release also includes many stability and performance fixes in addition to the new features (full release notes). Google didn’t mention its plans for the next version. I want to use Implement Bitcoins all state, I want Bitcoin's Current Value for USD Doller and INR through APIs. Is there any Free API provide who is almost near to Bitcoin's Real Current Value? 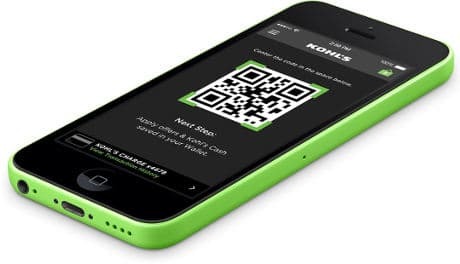 I have an Encrypted value which is very lengthy, Every time user should enter that key that is not user-friendly so we decide to create QR code and Scan it for input. I have tried many things but not able to Generate QR Code of Simple String. How can I generate QR Code and read it from Scanner? I want to create pdf in Codeigniter.I have researched many things but mostly paid or there is not that feature what I want in my pdf, Please developer suggest me any useful pdf generator. I want am developing a website for Writer he will write store novel on site and it will be converted to pdf for free distribution. So pdf has to be Images, Tables Formatted Text. Do you have any suggestion or tutorial? I'd like to draw a pie chart in my android application. Would you please suggest me a way to do that in a simple way?I have no idea how to create it So I would appreciate if you tell me a good and high-performance chart library or Pre Define Android widget. I am inserting data but how exactly I can know that my data is Really inserted. is there any predefine function or need to manually? Please help me to do this.